The name of this dish comes from where we found it — on the blog Food52. The old saying goes “Revenge is a dish best served cold,” but this luscious dish is actually best served warm or at room temperature — though it’ll be good cold too. With the crystalized ginger and Meyer lemon — sweeter and calmer than conventional lemons — and a topping that includes almonds and cinnamon, this is like getting two desserts in one. It’s sublime with pears, but probably would work pretty nicely with apples too. Demoed at Brookside in September 2014. Prepare the filling: peel (optional), halve and core the pears. Cut them into desired size pieces (chunks, bite-size) and place in a mixing bowl. Add the lemon zest, lemon juice, vanilla and chopped ginger. Mix gently. Add the sugar and flour, mix again. Set aside. Preheat the oven to 350̊ F. Prepare the topping: in a mixing bowl, cream the butter with the sugar and cinnamon. Add the flour and almonds. Fill 4 6-ounce ramekins with equal portions of the prepared pears. 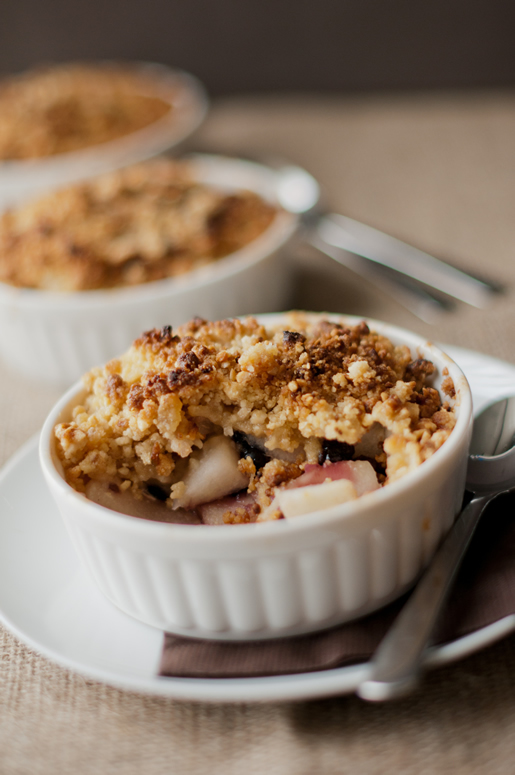 Using your hands, divide the topping into 4 portions and pat each ball into a circle of topping to cover each ramekin. Place the ramekins on a sheet pan, bake for 45 minutes or until tops are lightly browned and the fruit is bubbling. Serve warm or at room temperature with a scoop of ice cream. Serves 4. This entry was posted in Desserts and tagged almonds, ginger, meyer lemon, pears. Bookmark the permalink.